The University of New Brunswick today announced that New Brunswick students, Taylor Lee of Second Falls, N.B. and Brianna Forbes of Targettville, N.B. are this year’s recipients of the Arthur and Sandra Irving Primrose Scholarship valued at $40,000.00 ($10,000.00 per year for four years). This year’s scholars come to UNB’s Saint John campus with a history of exemplary achievements as students, athletes and community leaders. Taylor Lee, a former Fundy High School student, is the 2011 McCain Literacy Award winner, 2015 District French Oratorical Competition Gold Medalist, and Open Junior Champion at the 2013 Sunrise Summer Classic Horse Show. Brianna Forbes, a former Bonar Law Memorial High School student, is president of the St. Nicholas 4-H Club and Eastern District, a national finalist at indoor track and field, and a participant in the Duke of Edinburgh Gold Level Award. Designed to support students entering their first year at the university’s Saint John campus, the Arthur and Sandra Irving Primrose Scholarship recognizes academic achievement, community involvement and athletic leadership. The scholarship was established by Sandra Irving, a proud alumna of the university’s Saint John campus (BA’95), who spearheaded the fundraising activities to first award the scholarship in 2000. Primrose Scholarship recipients have a history of great achievement and they have gone on to become doctors, engineers, nurses, scientists, business leaders, artists, and community leaders. For additional information on the scholarship, please see the Primrose Scholarship. 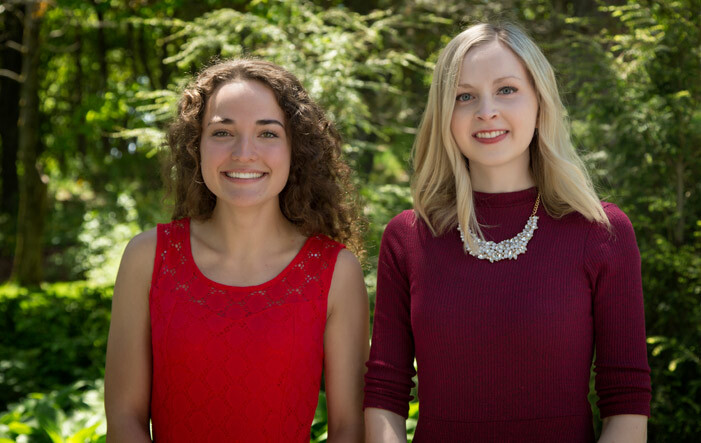 Photo: Brianna Forbes of Targettville, N.B., left, and Taylor Lee of Second Falls, N.B., are the 2017 recipients of the Arthur and Sandra Irving Primrose Scholarship valued at $40,000.